Choose MIDI/Audio > VST Banks and Effects. With this dialog box, you can load VST players for use with Finale and open the loaded player for editing sound channel assignments. Finale includes the ARIA Player, which is designed to use Finale as its host sequencer and includes the Garritan Instruments for Finale sounds. 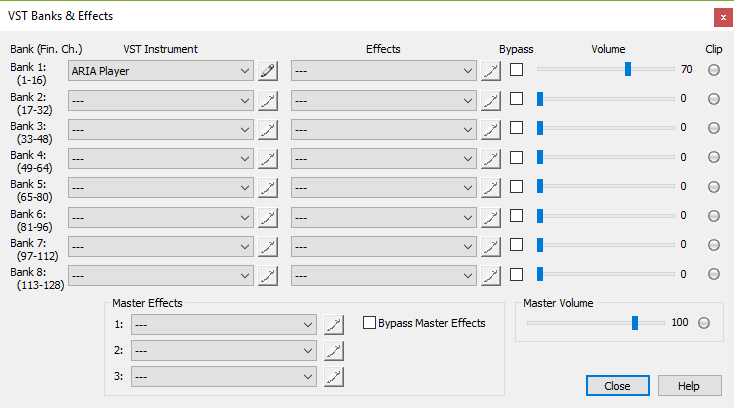 You can use this dialog box to load any other VST instrument library, select and edit VST effects, and adjust the volume for each VST selection. Noteman says: To automatically restore playback sounds based on your Sound Map priority, choose MIDI/Audio > Reassign Playback Sounds. Finale generally assigns sounds to instruments automatically, assigning the included ARIA Player or SmartMusic SoftSynth to banks with the corresponding instrument sounds. For example, when you add or change an instrument in the ScoreManager, Finale loads the necessary banks and instrument sounds (according to the priority of Sound Maps in the Sound Map Priority dialog box). When you make manual changes to banks or sounds in the VST Banks & Effects dialog box (and respective VST players), you are adjusting Finale's automatic setup, which means you need to be aware of how these changes affect other sound assignments (see Editing banks and players). Bank (Fin. Ch.) • Instrument • Edit. Each one of these dropdown menus displays all the sound libraries installed on your computer. The ARIA Player is included with Finale, which is used to load the included Garritan sounds. Click the adjacent button to open the selected player where you can add instruments and make other changes. The numbers to the left of each dropdown menu indicate the Finale Channels included in each bank. Finale offers 8 Banks of 16 Channels each for a total of 128 Channels. Noteman says: VST effects plug-ins are installed as dll files that usually appear in the same folders as the VST instruments. If you do not see the one you are looking for, you can identify any VST plug-in directory on your system by specifying it in the Manage VST Plug-in Directories dialog box. Effects. Each one of these dropdown menus displays the VST effects installed on your computer. Click the adjacent button to open the selected effect's interface and make changes. To reset the effect, use the Effects dropdown menu to select --- and reselect the effect. Bypass. Check this box to temporarily omit the corresponding effect. Volume • Clip. This volume slider applies to the volume of the selected bank of channels and their selected VST selection and effect(s). Finale illuminates the Clip indicator if clipping is detected. Clipping is detected if the signal goes beyond the bounds of a standard range. Click the clip indicator light to reset it. Master Effects • Master Volume. Use these options to apply effects and volume to the master mix. Changes to this section apply to all banks. Close. Click Close to apply your settings.